Maybe a bunch of dr. Who fans are now going to crucify me, because their minds have "Time and Relative Dimension In Space" etched into their neural pathways as the Acrosstic of choice. 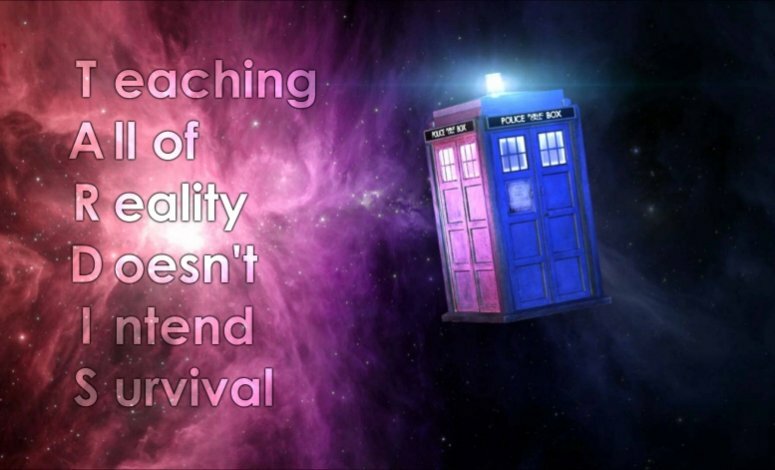 And yet my take on the same name does quite what the entire Dr. Who series has always done from the begining: teaching us that all of reality does not intend survival. Does that mean we won't survive? Now that depends: if you only look at it from 'physical reality', then our body dies, and whatever is left ends up somewhere else. An experiment in 1907 tried to prove that the soul leaves the body at death, by minutely tracking the weight of several persons at the end of their lifetime. It was later turned into a movie named 21 grams, but the experiment itself was considered flawed. Still, just how much difference is there between the physical reality we live in, and the less tactile but no less real world of our imagination? If we think of a future or remember a past, are they any less real than what is actually happening outside our brains? I put it to you that the knowledge we each hold about the reality we live in is represented in our brain. And if our knowledge is present in our brains, then the entire reach of our knowledge about the outside world is in there. And yet, none of it ever touched us, since the repelling power of electrons keeps all atoms apart!